I can’t even believe we only have one more week left of the One Room Challenge! Yikes! It is going to be down to the wire for sure. We still have so much to do! If you’re just joining me, we are transforming our 80s wet bar room/butler’s pantry into a modern coffee bar. You can be brought up to speed by checking out these posts: Week 1 / Week 2 / Week 3 / Week 4. I’m going to make this update brief since I still have a TON of work to do! 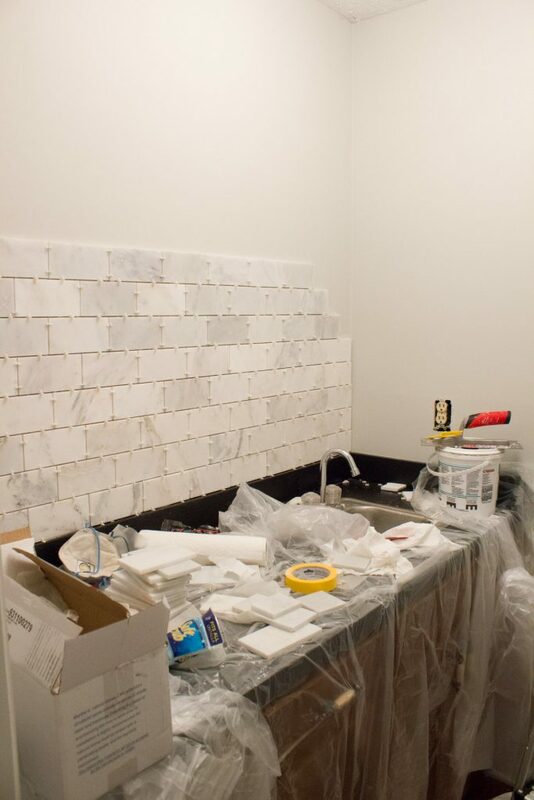 I started tiling this week, and I’m about halfway done and then I need to grout. We went with a honed marble subway tile and so far I’m loving it! I’ve ordered some accessories, and last week we installed the light. I also managed to prep the cabinets for paint, which I’ll do this weekend. Think we can finish on time? I’m crossing my fingers and holding my breath! Be sure to visit Calling it Home to see what all the other bloggers are up to! The Carrera is gorgeous. Time is running out but you can do this! Now stop reading comments and get back to work! Thank you, Maggie! I’m almost done!!! It’s going to be down to the wire for sure though. Nice! I’m looking forward for the finish product. Great to visit your site.